At Flash Memory Summit this week, Silicon Motion is previewing their first SSD controller designed specifically for enterprise and datacenter SSDs. The new SM2270 will be Silicon Motion's largest and most powerful SSD controller yet, with a 16-channel NAND interface and support for a PCIe 3.0 x8 host interface. We first learned of the SM2270's existence last year when a technical presentation from Silicon Motion mentioned the next-generation LDPC error correction engine developed for the SM2270 and SM2264 controllers. 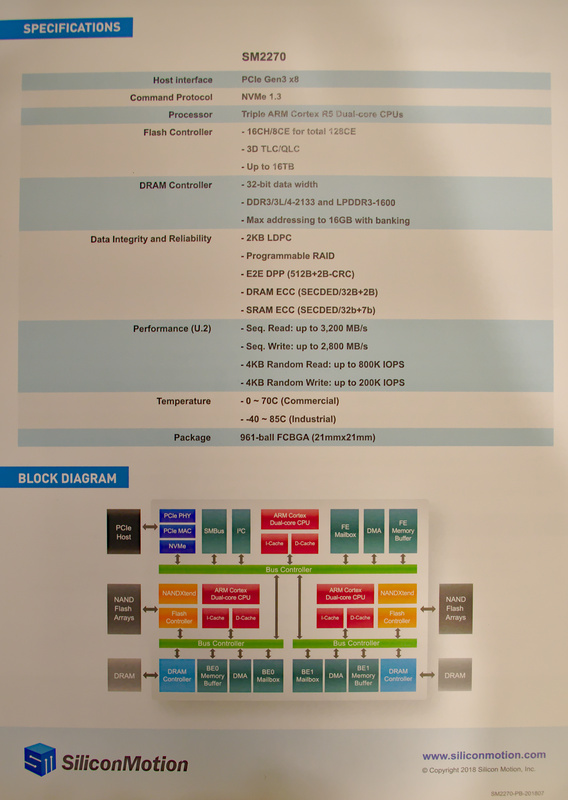 The block diagram for the SM2270 reveals an unusual structure with three separate dual-core ARM Cortex R5 CPUs. Silicon Motion essentially removed the front-end from the SM2262 8-channel controller design and put two of those on one die, behind a new wider front end with support for PCIe x8. This isn't the first dual-controller sort of architecture we've seen: Marvell is using a similar strategy with their dual-die 88SS1088 controller. In both cases, the new controllers seem designed to target Microsemi's Flashtec NVMe SSD controllers but without incurring the expense of a whole new design for a large-scale controller.